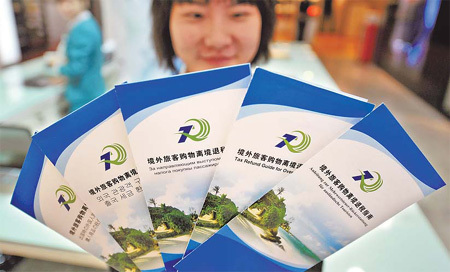 In May or June, Chinese travelers to the tropical resort of Hainan province will probably be able to buy tax-free goods worth several thousand yuan, said Lu Zhiyuan, director of the Hainan provincial tourism development commission. A tax would be levied on purchases beyond that amount, said Lu, who is also a deputy of the Hainan provincial people’s congress, on the sidelines of the ongoing plenary session of the congress on Tuesday. Starting Jan 1, visitors from outside the mainland have been able to claim tax refunds on purchases made on the island as part of a plan to turn Hainan into an international travel and shopping destination. "That’s preparation for a new policy that will also allow mainlanders to buy tax-free goods here, which would be crucial to further boost tourism and drive consumption in Hainan," he told China Daily on Tuesday. But Lu declined to reveal more details about the plan. Under current policy, the minimum purchase for which a foreign tourist can apply for tax refunds is 800 yuan ($121) and 21 categories of goods such as clothes and cosmetics are covered. Often dubbed "China’s Hawaii", the island attracts millions of holidaymakers from at home and abroad each year and more than 90 percent of them are still mainlanders, official statistics showed. In early February, some people argued the tax rebate would not attract tourists as Haikou Customs had received only 129 refund applications for purchases worth about 460,000 yuan since Jan 1. "That’s quite understandable as Hainan remains a new destination for foreign visitors, who are not strong buyers compared with mainland travelers," Lu explained. In recent years, the number of overseas travelers to the island averaged 650,000 a year, and they were mainly from Russia and Southeast Asian countries, Lu noted. "We are working on a series of programs to lure more foreign visitors, such as hosting the Miss World Beauty Pageant, setting up liaison offices in foreign countries to promote tourism and running commercials on Hainan tourism on CNN," he said. About one year after being recognized as an "international tourism island" by the central government, Hainan has made progress in infrastructure construction and policymaking, said Li Mingguang, a deputy to the provincial people’s congress. "The local residents’ manners and the governance capabilities of local authorities also need to be largely improved to help with the tourism development," he said.